Brief History - Navajo and Apache were among the native peoples inhabiting Arizona on the arrival of the first European explorers, Franciscan Marcos de Niza, and later Francisco Vasquez de Coronado, in the mid-1500's. Spanish influence continued in the southern part of the state, largely under the guidance of Father Eusebio Francisco Kino, a Jesuit missionary, who established several missions and visitas throughout the territory. Spain ceded Arizona to Mexico in 1821, and the US took over in 1848 after the Mexican war. The area below the Gila River was gained from Mexico in the Gadsden Purchase of 1853. The area became a territory in 1863 but continued to see unrest with the Apache wars, which ended with the surrender of Geronimo in 1886. Admission to Statehood February 14, 1912 and became the 48th state admitted to the Union. 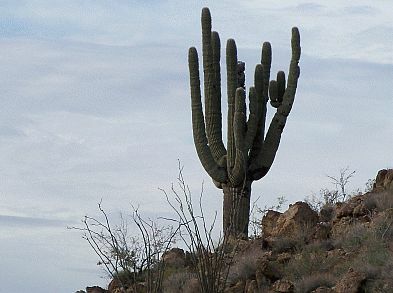 State Name - The name Arizona derives either from the Spanish version of the Pima Indian word for "little spring place," or perhaps from the Aztec arizuma, meaning "silver-bearing." Arizona is the only state with official state neckwear. A bola is a rope with weights attached used in South America to lasso cattle by entangling their legs. The bola tie similarly entangles the wearer's neck in ornamentation. Designed as dress-up neckwear by Mr. Cedarstaff of Wickenburg, Arizona, it sure beats putting on a standard tie in hot weather. It is considered an Arizona creation and is the offical state neckwear of Arizona, signed into law in 1973. It is usually made by silversmiths and leather makers in almost every size and shape, most often with silver and turquoise. Copyright Notice Hualapai West, Inc. All rights reserved.